Testimonials – D. Evans & Sons Ltd.
Great building company! Terrific extensive building work completed to high standard! Recommend! I was getting walls knocked down and rebuilt in order to extend my bathroom to incorporate a separate shower. The men arrived bang on time every single morning, on the first morning they put covers over all our internal doors which protected dust going into the rooms but, as the doors zipped, we could easily gain access to these rooms each evening. They also covered any carpet that would be in the way of the work they were doing. The men were all friendly, polite and very neat. We had an antiquated bathroom which required a new ceiling and walls so this was a large job yet we remained in the house for all but one night and the men worked around us ensuring that the house was left neat when they left each night … they even brought their own hoover. All debris was lifted each day and my neighbours all commented on how considerate the men had been with their parking. The men were patient with me as, at times, I found it difficult to make certain decisions. The communication was fabulous and I felt that I had a real understanding of what was happening when. The renovations have completely changed my house for the better and I could not recommend this company enough. If I could give one criticism it would be that I now feel, in comparison to my fancy new bathroom, my kitchen seems a little dated and I may have to get a new one fitted! At least I know I would trust D. Evans and Son Builders Ltd. to do that job for me! I cannot rate D Evans & Son highly enough. They were a fantastic company to deal with throughout the build of our extension. They kept the whole process very straight forward in the lead up to the build when other builders were not even prepared to quote for our job. Once the build started they kept us informed and talked through any problems in such a way that kept stress levels to a minimum. We had the added stress of a toddler in the house and a new baby on the way however the team at D Evans kept this whole process almost stress free. They timed the progress of the build in such a way that there was as little disruption as possible and made sure they were done before the baby arrived. Every night the house was left so tidy and in such a state that we could make the best of the facilities we did have after the main parts of the kitchen had been removed. The team were a delight to have in the house and we missed their cheery chat in the mornings after they were finished and gone! The quality of the build and finish is great and has been commented on by so many people. I would have no hesitation in recommending them to others and in asking them to carry out building work for us in the future. 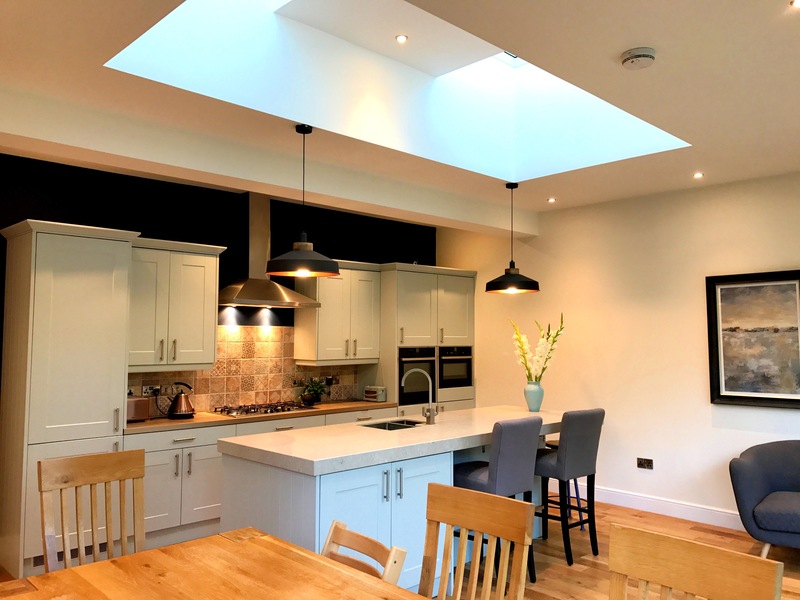 We’ve recently had a loft renovation, side extension and existing extension rebuilt with roof lights, sliding doors and new kitchen/living area. To say we’re happy with it is an understatement! We love our new space, the finish and quality is brilliant. The team went above and beyond to make it as stress free for us as we stayed in the house throughout. They rigged up a temporary kitchen for us which made it possible and worked around us. So glad we chose D.Evans & Son! Excellent workmanship and communication from a fantastic outfit. We could not have expected more from David Evans and Co. From our first meeting they set out a clear strategy for the construction of our extension and provided a competitive quote. We had not entered into the world of building before and were apprehensive about the stories you hear about projects becoming more expensive than originally scoped or taking far longer than expected. We were extremely pleased to work with D. Evans and co, who stuck to the quote and to the timescales. Whenever a problem was encountered they had a solution to it to suggest and were excellent at problem solving, going above and beyond what I think we could reasonably have expected. I would have no hesitation at all in recommending D. Evans and Son for a first rate service. We now have the extension of our dreams and that is largely down to the quality of D. Evans and Sons Builders Ltd. I first engaged David Evans and Son Builders in 1994 – since then, the Evans team have carried out a wide variety of tasks for me including a complete cottage renovation and rebuild, kit house erection and fitting-out, house extensions, bespoke kitchen fitting and extensive landscaping works. Some of the above wasn’t easy or routine, but David’s team was always able to overcome any challenges presented and I have been absolutely delighted with the finished job in each case. I have no hesitation in giving David Evans and Son Builders my fullest recommendation, in appreciation of level of attention they give to their Clients and the high quality of the work carried out for me over an association of more than twenty years. I started my project to build a 4 room extension and a full renovation of the existing 1920’s bungalow. I instructed David Evans & Son based on their solid reputation. They also recommended an excellent architect to realise the vision I had. The project was undertaken over a year and I have been delighted with the result. The team of joiners, electricians and plumbers worked on the project, becoming part of our every day life. The work was completed to a very high standard and my full vision was delivered. Many thanks to the full team! I would happily recommend you to other prospective buyers with a vision to build their dream home. Looking for a Builder? Look no further contact David Evans & Son. Sitting here in my lovely new garden extension room, the workmanship from start to finish was SUPERB! David’s employees who have been with him for a number of years and the Subcontractors working with him, are courteous, hard working taking a pride in their trades. David from start to finish on a project will ensure everything goes smoothly, keeping the client informed regularly, through the architecture design, taking the project through planning to completion. We as a family were delighted and would highly recommend his company.